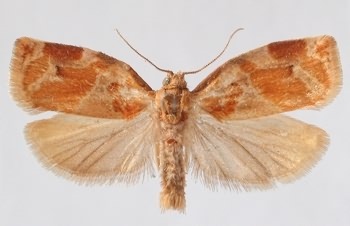 Class Insecta, order Lepidoptera, family Tortricidae, subfamily Tortricinae, tribe Archipini, genus Archips. Archips xylosteanus L., Archips xylosteana L.
It is a polyphagous pest of rosaceous crops and forest trees. Fore wings of imago (wingspan 18-24 mm) are ochre-yellow to light brown. The pre-tornal spot is transversely-elongated, not reaching posterior wing margin. Median band has constriction, having darker middle part. Pre-apical spot and paler, transversely-elongated outer marginal spot are connected by narrow bridge. Hind wings brownish-gray, with ocher-orange pollination at wing apex. Eggs green at first, later dark-brown with grayish tint. Young caterpillars look like those of Archips rosana. Later they become an olive color with blue tint, having two rows of black warts on dorsal side. Pupae are dark-brown, almost black, with lighter abdomen. Cremaster in form of drawn-out transversely striated lobe, curving ventrad that has 8 hooked setae. Average fertility is 150 eggs. Female lays eggs 2-3 days after mating in 3-4 egg-batches on rough surface of young and old branches; the batches look like rounded or oval shields and contain 20-60 eggs. The egg-batches are distinctly smaller than those in A. rosana. Eggs over-winter. Hatched caterpillars of 1st and 2nd instars penetrate buds and flower buds, gnawing them out, developing under rolled leaf margins or along main veins, skeletonizing young leaves. Caterpillars of older age roll cigar-shaped leaf tubes, rolling them toward base; they live alone or in small groups at twig tips. Duration of caterpillar feeding is 35-45 days. Pupation occurs in feeding places or in new tubes. The pupa stage lasts 13-20 days. Western Europe, Asia Minor, Iran, China, Japan, Korea. In the former USSR it is distributed in the European part (except for the north), in the Caucasus, Transcaucasia, Ural, northwest Kazakhstan, mountains of Turkmenistan, Amur Region, in the south of Primorskii Territory, on Sakhalin and the Kuril Islands (Kunashir). Everywhere it is monovoltine. Caterpillar hatching begins during the period of red bud in late varieties of apple (similar to A. rosana) or in sweet cherry-trees, i.e., from the middle third of April in Crimea and in the beginning of May in northern Ukraine. Pupation occurs from the end of May until the end of June in Ukraine and in July in the Moscow Region. Moths fly from the middle third of June until the end of July in Ukraine and Byelorussia and from the middle third of July until mid-August in the south of the Russian Far East. Their lifespan is 11-12 days with additional feeding on a sugar solution. This is an orchard pest that mainly causes damage to pear and apple trees in Moldova, Ukraine and the south of Primorskii Territory. Polyphagous caterpillars also cause damage to quince, apricot, plum, cherry, raspberry, mountain ash, and also currant, hazel, honeysuckle, oak, linden, ash, maple, poplar, willow, elm, etc. They have also been documented on coniferous plants. Agronomical measures include pruning old and diseased branches. Biological measures include release of Trichogramma in orchards during egg laying, application of biological preparations. Chemical measures include local insecticide treatments during hatching of caterpillars before flowering. Monitoring and forecast are possible with the use of pheromone traps.